Search.gracepot.com is similar to Search.mokytlerino.com, Search.ragitpaid.com, and several other browser hijackers. Just because it may be presented to you as a useful search tool, does not mean that is actually true. The hijacker’s goal is to promote its sponsors as that is how its developers make money. What this means for computer users is that they will be constantly exposed to various advertising data. As the hijacker is compatible with all major browsers, you will not be able to avoid the disruptions that it causes. We suggest that you waste no time and terminate Search.gracepot.com as soon as you can. The first action that the hijacker takes after it enters your PC (most likely with the help of freeware or shareware) is replacing your home page and default search engine with Search.gracepot.com. This website will start appearing on your screen each time that you open your browsers. It does not look especially different from other search portals, however, if you make use of it, you will get results filled with sponsored links. Moreover, the hijacker will add commercial data to other pages that you visit. You will not be able to browse the Web without encountering suspicious ads. Keep in mind that these adverts are not checked by anyone before they are presented to you. You could be faced with misleading or completely false content, interacting with which could lead to undesirable consequences. That is why we urge not to click on any adverts at least until you get rid of Search.gracepot.com. Although your online security should be reason enough for you to want the hijacker gone, it is also worth mentioning that the hijacker is a threat to your privacy as well. It collects information about your Internet surfing habits and uses this data for creating personalized ads. Please note that no matter how beneficial the ads may seem, they can still be fake. 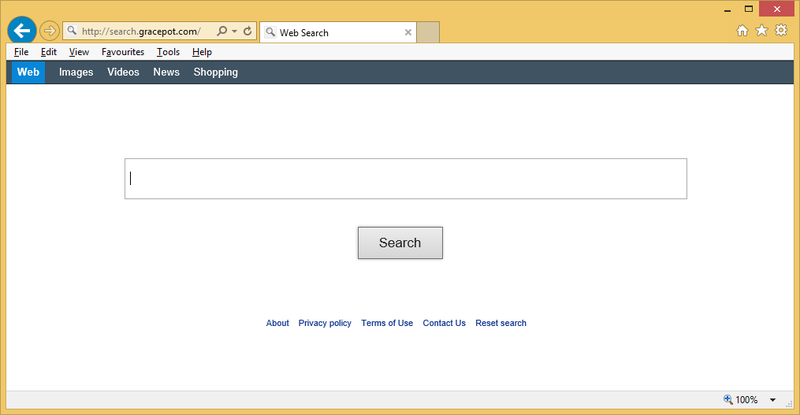 You can eliminate Search.gracepot.com from your browsers manually or automatically. We recommend the latter option, because it is more efficient and reliable. You can use the anti-malware from our site in order to erase Search.gracepot.com and clean your PC from other potential threats. Moreover, the malware remover also functions as a preventative measure, which means that it will keep your system protected as long as you have it installed and up-to-date. Alternatively, you can go with manual Search.gracepot.com removal. In order to delete Search.gracepot.com manually, you will have to uninstall the application with which the hijacker arrived onto your computer and then move on to fixing your home page and default search provider. These tasks are described in more detail in the removal guide provided below the article, which you are welcome to use.